Daily Spirit & Word 570: The Essentials Of Christianity. Over the last few weeks, since our Open Air Baptism, we’ve been running a Small Group Discipleship Course in church, but I’ve been thinking about it, the course that we’re studying emphasises many aspects of what life is going to be like for the follower / Disciple of Jesus, but it doesn’t really boil it down quite enough for me. What are the most important things every follower of Jesus must grasp? What are the Essentials of Christianity? Once we grasp that we can continue in our discovery of everything else that the LORD has prepared for those who love Him. So what are the Essentials? Is it developing a strong prayer life? Is it a disciplined pattern of Bible memory? Is it to be a faithful witness to those who don’t yet know Jesus Christ as Lord? Is it to be a worker of wonders? Well there’s no doubt that those things are critical to every followers walk, but there are a few more basic elements. I used to go down old Tin Mines with a group of friends in Cornwall at the weekends, we’d meet up in the London Bar in Redruth and then proceed on our adventure. Mike Merry, who was a Mine Assayer, had ancient abandoned Tin-mine maps and would lead us on trips into the wilds of Cornwall 🙂 to find the long-lost mine entrance. Once we hacked away at a hedge in a lady’s garden, she was amazed to discover that there was a great big hole she never knew was there, it was only covered by a little hedge, but that hole opened up a voyage of discover and a trip into Cornwall’s history. It was a hand-carved tunnel, shaped like a Key-Hole and it went straight into the solid granite; we found tools, miner’s lamps and bits a pieces down that mine. No one had been in there for hundreds of years. It was a real WOWzer! But going into old mines is dangerous, there could be a build up of toxic gases so we had to be vigilant. Getting into the Essentials will enable us to know what’s MOST CRITICAL for every follower of Jesus, yes there are some really exciting aspects, but sometimes they are like those bits and pieces of treasure we discovered, they can become so alluring we forget what’s most needed in our walk with the Lord and it’s dangerous to ignore the Essentials. 1) HOW’S YOUR FAITH? — In our following Jesus are we believing in God? If I were to ask you to spell FAITH you’d probably say, “F, A, I, T, H” right? Well is partially right 🙂 I would like to venture that we should think about FAITH as “R, I, S, K” because if you are not daring to trust God by believing ALL that He’s said, we’re beginning to get a bit stuffy in our form of Christianity. As you know, like ponds and old mines, things that lies still for a long time get stale and stagnant, so it is with your FAITH. Are you demonstrating a willingness to take a RISK when the chips are down? Like David when he was a young man who wanted to face up to Goliath for God’s Name Sake. (David didn’t want Israel, God’s chosen people, to be shamed because of a mere man). Remember how Daniel was thrown into the Lion’s Den? and how Shadrach, Meshach and Abednego? 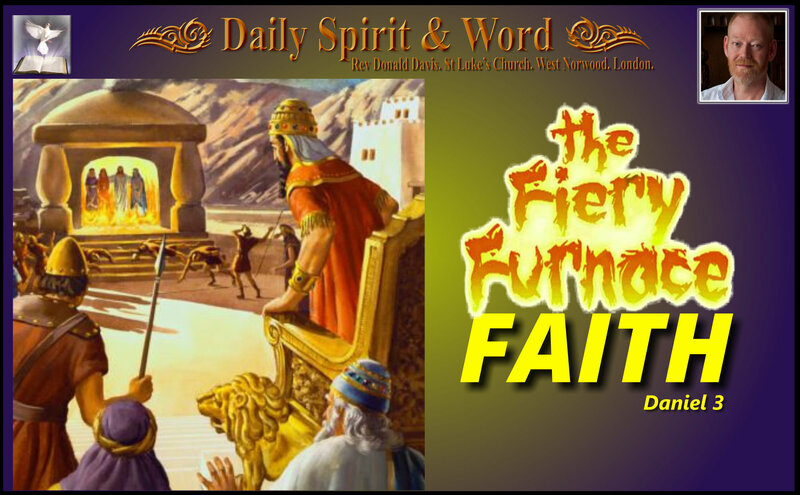 (Daniel 3) faced the fiery furnace. Is your own faith really prepared to take those kinds of RISKS? It was a sad day for everyone on Monday, we had the funeral of an Infant, Mina Esther Nystrom, who’d died in the womb. Though obviously devastated, John and Josi had been and were still going through the fire and had proven to have a faith that could be tested. They were both still praising the LORD. Yes they grieved the loss of their precious baby. Like every new parent, they had dreams for their child, but it was not to be. The LORD gives and the LORD takes away. However, they knew they could not deny their love for Jesus or for God’s gift of faith. In May, knowing there was something wrong with the baby, Josi and John got baptised in St Luke’s Church; In July (on Monday) they buried that baby. They had lost the most precious thing anyone could ever wish to loose and still they continue to walk with and praise Jesus. That kind of fiery faith is REAL. So what is it that God wants us to do? If the first ESSENTIAL is FAITH, then the second must be …. 2) HOW’S YOUR HOPE? — Are you living as a Member of God’s Kingdom? Is your thinking Kingdom focused? I used to live in Plymouth, an ancient part of the City marks the spot where the Pilgrim Father set sail from England, to escape persecution and begin a new life in America. It’s still a very special place at sunrise, so peaceful and quiet. But they demonstrated that they would NOT LIVE in a world where their faith in Jesus would not be tolerated. What they showed the world was, that this place, Earth, was NOT THEIR HOME, but they had a hope of a better place and were prepared to give up everything to continue to worship Jesus. So quite rightly they’ve been called; “The Pilgrim Fathers”. A Pilgrim is focused upon God’s Kingdom priorities in life and looks forward to their Eternal home in Heaven with deep assurance that it’s their real home. Are YOU a Pilgrim Christian my friends? Are you living with this deep HOPE in your heart? It’s a fruit of the Holy Spirit, it’s evidence of His presence in your life. You’ll demonstrate that HOPE by the way that you invest in your Eternal future, in your giving, generosity, kindness, because you’ll be INVESTING in your Heavenly rewards instead of Earthly things that you cannot take with you. You’ll LOVE Heavenly Focused Hymns and Songs: Like, “Blessed Assurance, Jesus is mine, oh what a foretaste of glory Divine”… that’s Pilgrim focus, that’s Kingdom mentality. Hebrews 11:13-14 13 All these people were still living by faith when they died. They did not receive the things promised; they only saw them and welcomed them from a distance. And they admitted that they were aliens and strangers on earth. 14 People who say such things show that they are looking for a country of their own. (A HEAVENLY ONE). 3) HOW’S YOUR LOVE? — The way that we really show God’s love is by how SELFLESS we are as followers of Jesus. A true follower of Jesus will be so touched and transformed by Christ’s LOVE, that he or she will want to (NOTICE that, “want to”) show love towards others and serve the LORD with complete willingness. It’s a want to my friends, it’s not as if God has to poke and promt a true believer into action. Your heart’s desire will be to serve the LORD in any way He directs. That will be very costly at times; in time, in money, in energy. It will mean sacrificing what you’d like of love to be doing and going the extra mile for Jesus. You’ll be desiring to serve rather than indulge yourself. 2 Corinthians 5:14-17 “For Christ’s love compels us, because we are convinced that one died for all, and therefore all died. 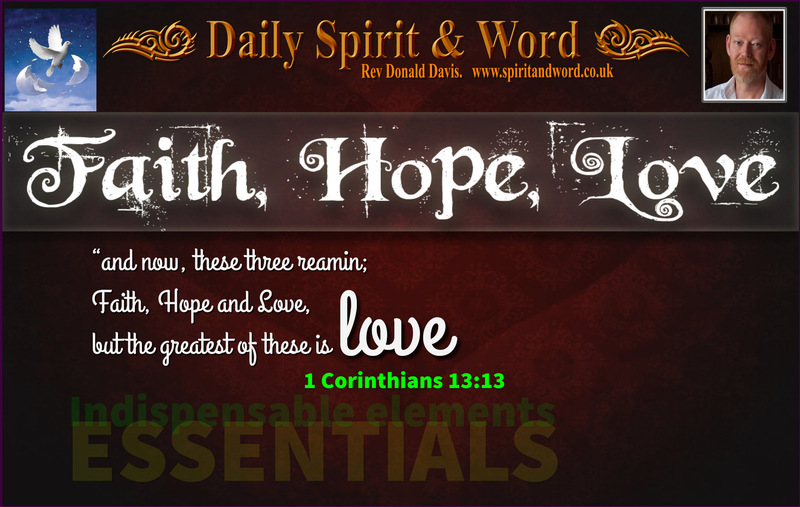 God’s WORD reveals these three; FAITH, HOPE & LOVE as the ESSENTIALS for the follower of Jesus. It does so in countless different ways, over and over and over again. 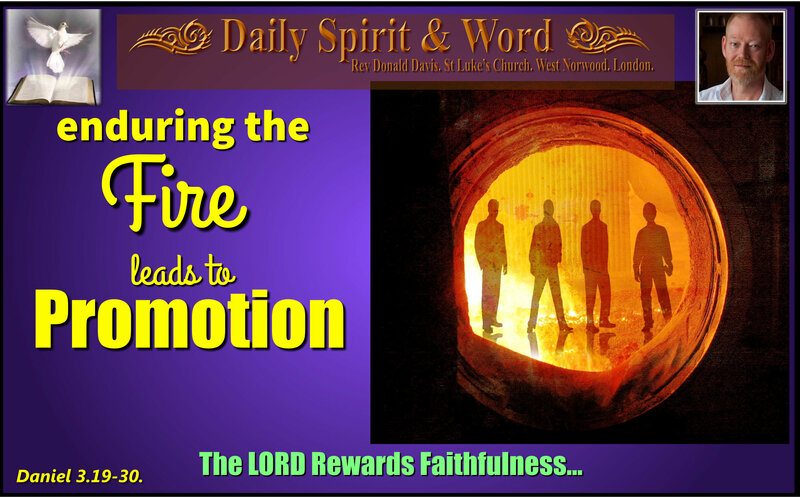 Read about Joseph, Abraham, Isaac, Noah, Moses, Elijah, Samson, Daniel, Ruth, Esther, Solomon, etc etc etc… they ALL demonstrated these ESSENTIAL elements in their walk with God. An essential is something, that without it, it will not stand: i.e. a three legged stool will not stand with just two legs or one. Now it’s your turn, the batton has been passed, you’ve got the KEYS to the KINGDOM, now lets go and open the doors for others to see and seek God’s glory. Amen! Have a fantastic day my friends, I’m praying that you’ll be full of FAITH, HOPE and LOVE today. Amen! P.S. Please, continue to pray for Josi and John as they grieve the loss of thier baby Mina Esther. Her death has touched so many people who know and love them, but we’re also encouraged by their testimony of the Lord’s faithfulness and presence in their heart-wrenching trials. It’s such a joy to have led them to Jesus and know that they’ve found Jesus to be the LORD of ALL. Amen.